If the present low inflation and low rate scenario coupled with earnings and valuations tell us something, it is that the high absolute returns you have seen since 2013 may come down and you may have to re-calibrate your expectations accordingly. With the markets delivering close to 20% returns on a year-to-date basis, many of you may set this as a benchmark for future returns. We will have to caution you that such expectations may not be realistic. If the present low inflation and low rate scenario coupled with earnings and valuations tell us something, it is that the high absolute returns you have seen since 2013 may come down and you may have to re-calibrate your expectations accordingly. Please note that this does not mean that the ‘real returns’ from your investment would come down. 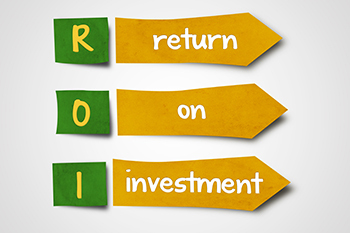 Real returns are what you get from your investment over and above inflation. So, even if absolute returns trend down, it would still likely be above the inflation rate, delivering healthy real returns to your portfolio. Here’s why you should reset your return expectations for the next couple of years and not merely go by past returns. First, global commodity prices have stabilised and all indications suggest subdued future prices with marginal ups and downs. For India, the primary driver of inflation on the commodity side is oil and oil has seen a significant let up in prices since 2014. Oil is an important inflation driver simply because everything that you consume right from shampoos to paint to fuel are powered by oil and its by-products. The supply economics of oil has undergonestructural shifts since 2014. The US has almost doubled its oil production in the past few years and produces enough to even export. The oil that it imported earlier must therefore find other takers in the global market and that hasn’t happened. Lifting of the sanction on Iran brought it into the international oil market, even as Canada and Iraq increased supplies. While the supply scenario came to a state of glut, the demand did not keep pace. China went into a slowdown while Europe started investing more in clean energy. All these meant that this was not just a temporary supply demand mismatch. In fact, the International Energy Agency has stated that oil supply in 2018 will outstrip demand. Second, food inflation is showing signs of taming due to structural shifts. Bumper crop on the back of good monsoons and destocking (GST) have kept inflation low, but these are temporaryfactors. On a more sustained basis, the minimum support price has been kept within a tight range over the past couple of years, thus breaking the usual accusation that MSPs are inflationary. In 2016 for instance, even while MSP for pulses were hiked sharply, it remained modest for paddy. This encouraged production where it mattered, to keep supply healthy and prices under check. For 2017-18 too, the MSPs have been in the range of 5-8% for kharif crops, not too high nor too low. It appears that fiscal prudence has scored over short-term income enhancing measures. The Government has instead decided to focus on long term income development measures such as unified agriculture products market, expansion of storage capacity, irrigation fund, new crop insurance and rural development. Third, and most importantly, adoption of an inflation-targeted policy means identifying early signs of shift in inflation trend and being pro-active in keeping inflation stable. According to a recent article in the media, an economist stated that emerging countries that have adopted inflation targeted policies have managed to achieve their target around the 4th year and that happens to be 2017 for India. Now what do these mean for the economy and for you? It simply means that the economy must (and probably is) readjust itself to a low inflation and low rate scenario. 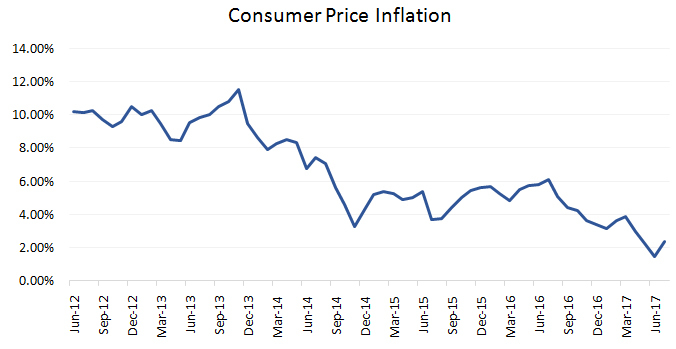 A low inflation is not the best for generating high nominal GDP growth.The second volume of the Indian Economic Survey has recently given a 6.75%-7.5% range for GDP growth this fiscal. With an inflation of around 4%, a 11-12% earnings growth for companies seems realistic. To peg your own return expectations to that level would be more prudent. This is because, given the current capacity levels in most sectors, it is unlikely thata situation of excess demand will occur. That means a need for private investment may not arise any time soon.And for earnings to grow faster than that, companies need to invest more. As can be seen at present, no amount of rate cuts has revived corporate credit growth, suggesting reluctance to invest. If you are trying to conclude that returns from equity would be low - not really. Your real returns would still likely be comparable to earlier years. Let us take an example: In FY-12, GDP growth was 6.2% and inflation was 9%. Your return expectation of 15% was not unreasonable for the next 3 years and markets did deliver those returns between FY12-15. But with inflation at 4% and an expected GDP of 6.75%-7.5%, your return expectation cannot be far higher than 11%-12%. This is what we mean when we say temper your return expectation. Your real return in both the cases would still be 6-7% unless there is a significant slowdown in economic growth. It is the real return that you need to aim to keep intact and equities as an asset class seeks to do that. If that were on the equity side, on the debt side, a stable inflation means that we may be at the fag-end of rate cuts. The problem with Indian FD investors is that they have never really seen a period of prolonged low rates. There have seen rate cuts like in 2001-03 but quickly followed by upward movement of rates. While shift out of FDs may become inevitable, investors too need to temper return expectations from debt options such as debt funds. Rallies in debt market may soon be done with. 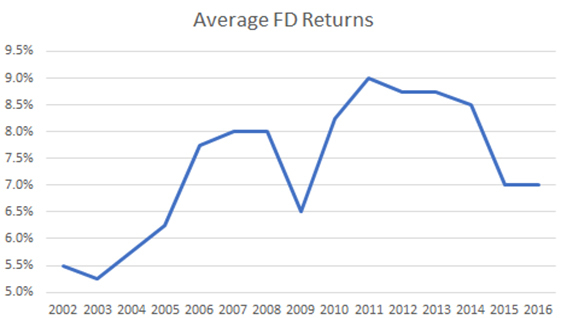 The double digit returns from duration funds would become more normal – to high single digit returns, albeit comfortably delivering higher ‘real returns’ than FDs. In different markets, macro-economic changes influence the returns delivered by various asset classes. Setting realistic expectations is necessary not only from an investment perspective but from a goal setting perspective. We are at one such structural shift now, driven by low inflation. It is therefore imperative that you keep your return expectations moderate from a 1-2-year perspective. For those with long-term goals of say 10-15 years, nobody really knows whether a 4% inflation or an 8% inflation would prevail then. It is also a different matter that ‘real inflation’ – the cost of education, rent, medical bills may move much faster. For these, the only way out is to save more, not expect higher returns!As long as you are invested in an asset class that generates sufficient ‘real returns’ for you, you should worry less on returns and focus more on saving and investing. Looking at exit points to book profits or trying to re-enter at lower levels are sub-optimal methods to invest in anyscenario. Disclaimer: Mutual fund investments are subject to market risks. Please read the scheme information and other related documents carefully before investing. Past performance is not indicative of future returns.